What if She Doesn’t Want a Traditional Diamond Engagement Ring? Some women prefer a bit of color in their engagement rings. This popular trend is evidenced by the many requests for designs imitating Princess Kate’s striking sapphire and diamond ring that once graced the hand of Princess Diana. There are several precious gemstones that are beautiful alternatives to the traditional diamond engagement ring. 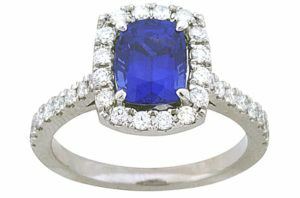 The “Big Three” colored precious gemstones are ruby, sapphire and emerald. The rich red and serene blue hues of ruby and sapphire make striking center stones for engagement rings, and their hardness, toughness and stability (resistance to scratches, breaks, and heat/chemicals, respectively) make them excellent choices. Lush emerald, while a stunning gemstone, rates poorly in all of these categories and is therefore a risky choice for a ring that is meant to withstand decades of daily wear. We often recommend green Tsavorite garnet, found only in Kenya, as a lovely alternative to emerald; it is hard, tough, and stable, and achieves a brilliant diamantine luster when polished. And both sapphire and garnet are available in a rainbow of hues to include shades of yellow, orange and purple as well. Or, if she loves the superior strength and polish luster of diamond but wants something unique, there are several options there—such as fancy yellow, warm brown, elegant black and vivid blue diamonds. Creating the most precious and frequently worn piece of jewelry a woman may own can be an exciting opportunity for expressing her personality and style. Let the experienced designers at Dominion Jewelers show you the possibilities!